Discovering Center is the ideal option to learn about the history of old cities as Cienfuegos, Trinidad and Santa Clara. It is a journey that reveals the history of the country and the Cuban revolution. It also includes two nights at an all-inclusive hotel in Cayo Santa María, where you will be assured of a world of authentic and unforgettable experiences. Accommodation with breakfast included in private VIP houses. 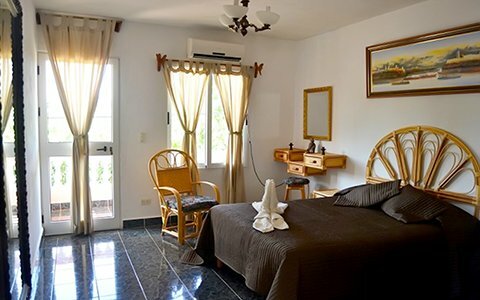 Two nights in All-inclusive Hotel in Cayo Santa María. Cienfuegos City Tour, Trinidad With Sugar Mill Valley Tour, and Santa Clara Tour. All tours have specialized guides in English and Spanish. Tours include lunch and entrances. Transportation in classic and modern air-conditioned cars. The guides and transportation are private, that is, exclusively for you. Duration: 5 HRS Departure Time: 09:00 HRS Notes: Terry Theater entrance fee, Complementary drink, Lunch, Transportation and Guide Service. Cienfuegos is the only city in the country founded by French settlers, many of them from Louisiana. It's an easy-going place, noticeably cleaner and more spacious than the average provincial capital and deserving of its label as the 'Pearl of the South'. Its most alluring feature is its bayside location on the Bahía de Jagua, also known as the Bahía de Cienfuegos, which provides pleasant offshore breezes and some sleepy views across the usually undisturbed water. You will spend half a day unveiling the secrets of Cienfuegos city and enjoy a panoramic tour through the National Monument (La Punta), El Palacio de Valle and El Paseo del Prado. Stroll along the boulevard to visit the monument to one of Cuba's most treasured musicians, Beny Moré. 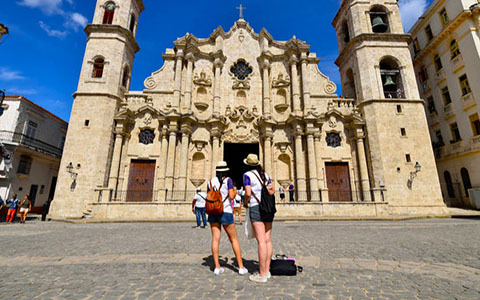 Make the most of your time in the city's heart by visiting the Cathedral as well as the Thomas Terry Theatre, one of Cuba's oldest and most beautiful theatres. Lunch is included at a local restaurant. Founded by Spanish colonizer Diego Velasquez as the third settlement of the island, the colonial gem of Trinidad is nowadays one of the best preserved towns of the Caribbean and the second in Cuba to earn a UNESCO listing after Havana. 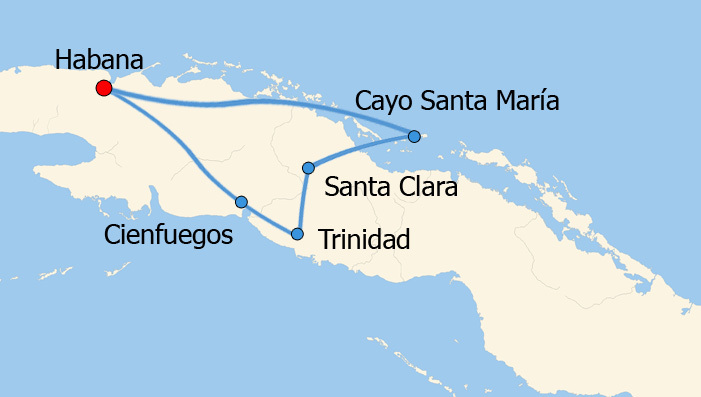 After Hernan Cortes set sail from here to discover Mexico, the city became incredibly wealthy through the sugar trade and the exploitation of slave labor in the cane sugar mills of the Valle de los Ingenios. Much of the heritage remains visible today and can be explored in and around the colorful cobblestone streets of Trinidad. Trinidad is the best preserved colonial town in Cuba and the Valle de los Ingenios is a living museum of the former sugar trade of the 18th and 19th century. This UNESCO site is located at the southwestern coast of Cuba, in the Sancti Spiritus province, in the center of the island. Originally founded in 1514 by Diego Velazquez, most buildings in Trinidad date from the time of the sugar trade in the 18th and 19th centuries. The UNESCO inscription happened in 1988. You will be the protagonist of a spectacular journey to UNESCO World Heritage Sites Valle de los Ingenios and Trinidad. You will climb to the top of the Manaca-Iznaga tower and rejoice with the jaw-dropping landscape. Continue to Trinidad for lunch at a local restaurant and afterwards, wander through the historical centre of the city to admire its remarkable colonial architecture. Stroll through La Plaza Mayor; visit the Romantic Museum and stop at La Canchanchara bar and a ceramic workshop. Duration: 3 HRS Departure Time: 11:00 HRS Notes: Guide service and lunch included. Explore the historical past of Santa Clara through its revolutionary legacy. Situated in Central Cuba, Santa Clara is steeped in history as a result of the battles that took place during the Cuban revolution. Visit the Ernesto “Che” Guevara Mausoleum, the Armoured Train ParkMuseum, Leoncio Vidal Park and the Boulevard. Lunch is included at a private restaurant. Transfer to Cayo Santa María all-inclusive Hotel. Cayo Santa María is a small island off the north coast of Cuba known for its beaches and water sports. Las Gaviotas beach, in the northeast, is surrounded by the exuberant vegetation of the Cayo Santa María Wildlife Refuge, which is home to a large number of birds. The central shopping complex Pueblo la Estrella has a craft market, restaurants and bars. In the Cayo Santa María Aquarium-Dolphinarium you can watch dolphins and sea lion performances. In Cayo Santa María, you are assured of a world of authentic experiences, at the same time relaxed and intense, starting with the pleasure of diving. Obviously, in Cayo Santa María the absolute protagonist is the sea. The luxury of bathing in fabulous turquoise water beaches in a place of great natural wealth, which is a Biosphere Reserve, adds the possibility of enjoying the sea in all its dimensions: snorkeling in beautiful places, diving with immersion equipment at the edges of the coral reef, go on a full day excursion on a large catamaran, navigate in small motor boats through the magical labyrinth of channels, cayuelos and natural pools of the herradura keys, interact with dolphins, catch large trolling fish in the Gulf Stream or surrender to fly fishing in the shallow waters of the Archipelago of the King's Gardens. Ideal to know the best tourist attractions of western Cuba. Three nights in Viñales, three nights in Havana and two famous beaches: Cayo Jutía and Varadero. See more. You will know Havana's Cuban capital and its surroundings from different angles. You will have day and night excursions, about city, nature and culture. See more.